Career path planning and tips to take charge of your career to avoid dead-end jobs and job-hopping using QUICK and EASY FREE online resources. As mentioned in the previous video and post, the goal is to avoid Lateral Moves. By making lateral moves, you’d have to start over and over, at a level no higher than your last position. Upward Mobility is the goal—for a career with better pay and stability as opposed to job-hopping. Start looking at your experience in terms of career advancement. The first resource is “GigZig”, which is a part of Payscale.com. It’s the quickest and easiest to use, but it has the least detail. On the right, you’ll see a list of the most common career paths which other people with that position took 5 years later. The most popular career paths of others who held that job title will appear on the column on the right. Clicking that next title only replaces the search term instead of giving you more detail about that position. Logging in and creating a profile will give better detail for your experience, education, and location. Or–you can use a search engine to search for “payscale” and the desired “job title”. The first result will likely be the link for the payscale site’s entry on that job title. The segment shown, “Common Career Paths”, is usually midway down the page of a payscale.com report. 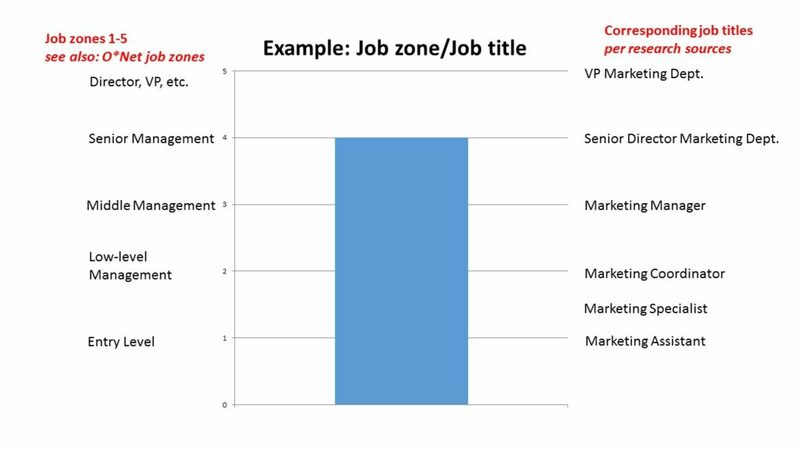 You can see not only the most common next position, but also the next common position after that on the career path. Mouse over a path for more detail (in a description box). By clicking the path, it will take you to a report for the next position on that path. The detail and simplicity of the Common Career Paths charts makes it one of the best career research tools. It’s important to know which skills are most useful for your target position so that you can be proactive–start learning now in order to meet the requirements of the next position. Pick a position from the “Common Career Paths” section. Check the “Popular skills” chart for that next position. Each site has its own strengths and weaknesses. Using this chart to decide which resource to use can save time. My Next Move is actually part of O*Net. O*Net is best for serious research. My Next Move’s summaries are shorter—usually 2 printed pages, versus O*Net, which averages about 7 pages. For the My Next Move report, you’ll find the second half of the report more useful for career path planning. You can browse by industry, but in our example, we will browse by job title by entering a job title in the search box. Knowing the most common level of education for a career can help you avoid wasting time and money on an advanced degree if it isn’t necessary. Likewise, it is important to know if your own credentials are lacking. Clicking any related occupations on the “Explore More” list will take you to the My Next Move report for that job title, so it’s a quick way to browse similar careers. By clicking the link at the bottom of the page, you’ll go to O*Net’s more detailed report of the same job title. You can go to O*Net’s website directly, and use the search window labeled “Occupation Quick Search” or do a search for: “onet” plus the job title. The previous sources are better for learning about specific job titles, and O*Net is best for detail about groups of closely related job titles. For the quickest use of the site, scroll down to “Education” and “Related Occupations”. See the video for the snapshot of what those two segments look like on O*Net. This example uses the same sections from the My Next Move site, but this site has more detail. The education section shows what percentage of employees with that job title have a specific level of education. All section on O*Net have more detail, which is why I highly recommend it for career research. Some positions aren’t quite one full level up–but it’s an important step to gain skills and experience. It’s important to be aware of the education, skills, and experience necessary to get up to the next level in order to plan your career path. Career levels can vary by industry, company, and other factors. For more great career tips, subscribe to our Youtube channel. For personalized assistance in your career search, contact CrossRoadsINDY at 317-842-8881.